What Is Optimal Learning and How Do We Nurture It? A few years ago, Dr. Steve Peters, a neuropsychologist and director of the Memory Clinic at Utah’s Intermountain Healthcare, was invited to talk to a group of leaders at Cisco Systems, the technology company. 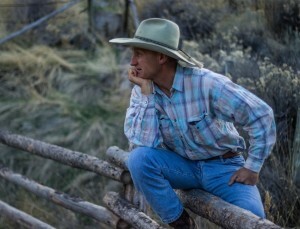 Dr. Peters watches a mustang. Are you and your horse often alert and engaged? The group wanted to know how best to teach Cisco’s complicated networking schemata to employees, in person and through teleconferencing and video platforms. Quickly and effectively, they needed to reach a broad audience with varied aptitudes for learning. How best do we do this? How do we keep them engaged and teach them so that they can move forward with their new knowledge? To make his case, Peters got down to the nitty-gritty. He described what learning looks like on a cellular level. We’re not talking about rote memorization or short-term memory here, but rather, the absorption of knowledge for the long haul. It’s an outcome called Long Term Potentiation. You’re listening, half-heartedly taking notes, and thinking in a distracted way about what you’re hearing. 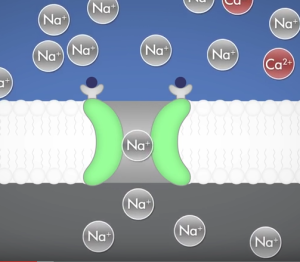 On a molecular level, the neurochemical glutamate is enabling the transfer of sodium from a presynaptic neuron to a postsynaptic neuron through so-called AMPA receptors. It’s a weak synapse and is not enough to cause Long Term Potentiation. Now, consider a moment when you’re in the front row and at the edge of your seat. That engaging moment is followed by more reading and discussion with classmates. You feel good about your ability to expound on the topic (read more about dopamine’s effect on learning here). On a molecular level, an increased concentration of glutamate has let even more sodium through receptors of the post-synaptic cell. 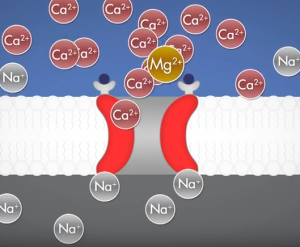 More sodium there causes a repulsion of a plug of magnesium that previously had been blocking another type of receptor, called the NMDA receptor. That’s Long Term Potentiation. 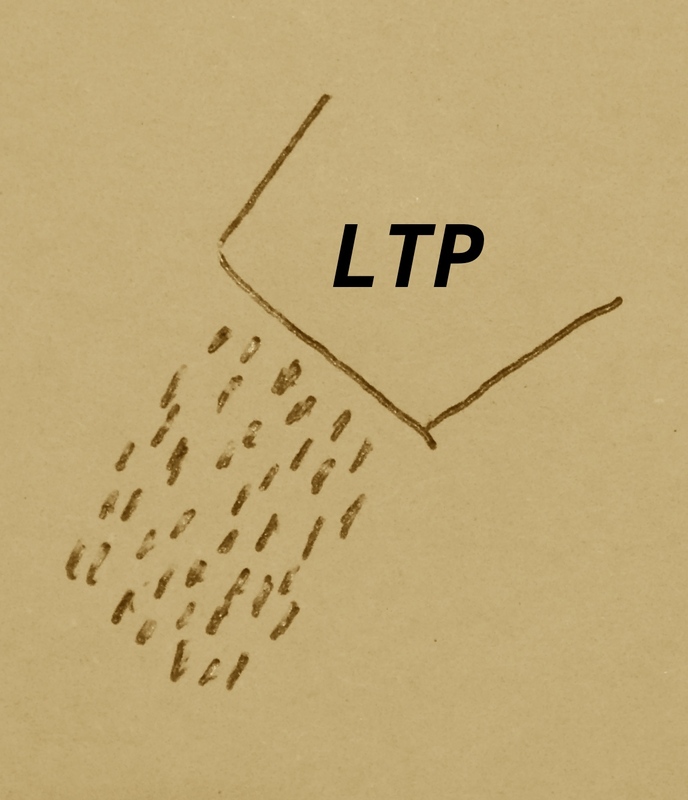 Watch this excellent video of LTP. 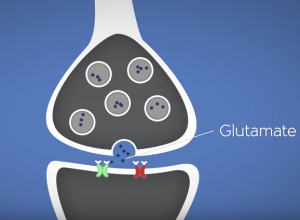 If getting smarter comes from the accumulation of sprinkles of connections, then LTP is when your brain shifts that sprinkle to a healthy pour of synaptic connections. Lazy learning is a single-lane, ramshackle bridge, leading from one neuron to the next. 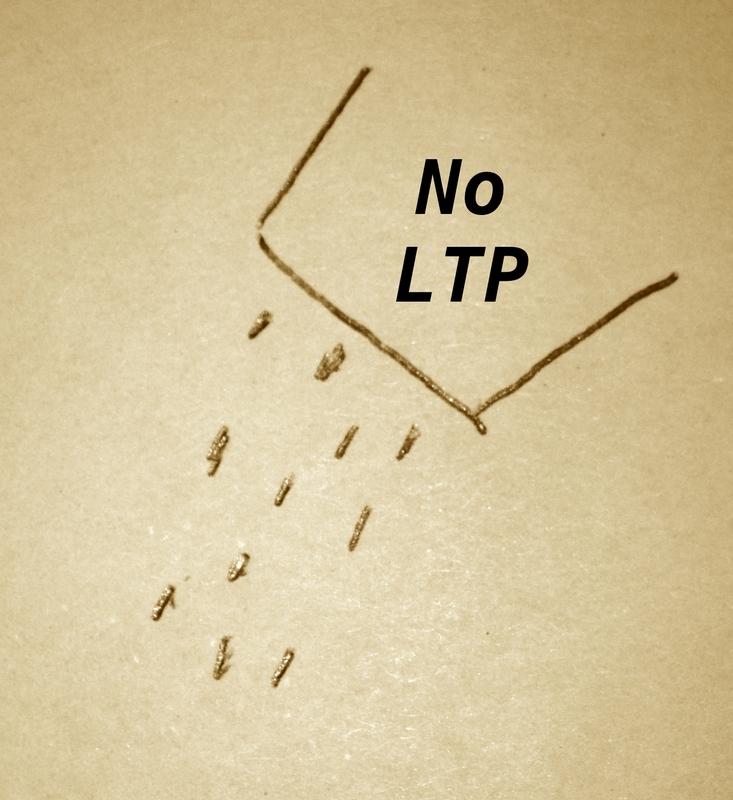 After you pay the toll of increased focus and engagement, LTP is a wide, smooth thoroughfare of a bridge. Yahoo! In the Cisco meeting room, people were intrigued. As horse owners we, too, should pay attention to this learning outcome. How do we get our students (horses) to the point of LTP? — Even if the work is tedious, it can and should be presented in a non-tedious manner. In other words, make it fun and get creative. Don’t repeat patterns over and over and over. 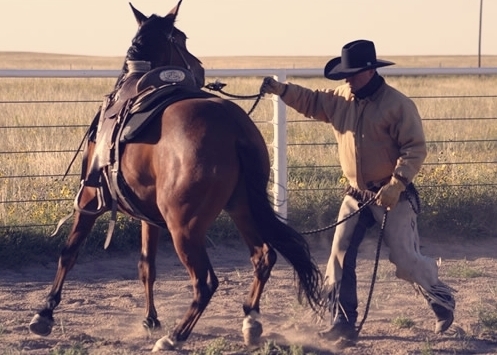 Drilling will make your students (horses) frustrated, annoyed, and resentful. — For maximum engagement, keep lessons short and energetic. Allow for recesses. — For your student’s optimal learning, find his/her ideal psychological state between comfort and fear, between boredom and panic. — Remember that threatening students with severe punishment can activate their fight or flight response. Neither horses nor humans can learn when they’re panicked. — Incorporate on-the-job training and use immersion techniques. Foreign language students learn better when they are using that language and incorporating into other tasks. 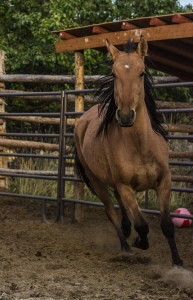 Horses learn about side-passing and turning on their fore and hind, when they are working with cows, moving through gates, or out on the trail. Martin’s horse is alert and engaged. 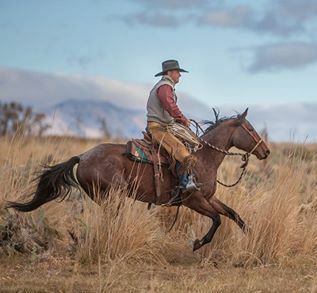 While some riders have found this ideal learning state, many fall into two groups populating each edge of the territory: they are Nurturers and Warriors. Nurturers (mostly women) never get out of the comfort zone. Warriors (mostly men) are prone to bouncing off the flight or fight territory of horses’ sympathetic response. Read about the autonomic nervous system here. Head is up. Ears are engaged. It’s the ideal moment for learning and an opportunity many riders unfortunately quash. “That’s when people start to get uncomfortable because they’re not sure what’s going to happen. But that’s precisely where people need to experiment if they are training a horse. Maybe the rider needs more experience and being successful without hitting the ground. But once you say, I’m going to be more of a trainer and less of a passenger, you’ll gravitate to this zone,” said Black. Posted in General and tagged long term potentiation, ltp, Martin Black, Steve Peters. In my opinion, I would say there are two ways of learning; whether one is riding, driving or has a horse in-hand. The two ways are intentional and unintentional. Obviously the Intentional method would be most expedient and informative; with the unintentional being more haphazard. Both can be accomplished with a low energy or a high energy. For example; In 2003, I and about 15 others help the Dann sisters of Pleasant Plains Nevada gather 450 head of Wild horse. One morning I sat and watched 5 short yearling, as they took about 20 minutes and learned how to work their way through a pile of Junk that was very hazard to their health; had they spoked. The process was the leader would move forward and stop when he felt he needed to figure out his next direction. The next in line waited until the leader moved forward; giving the second in line room to move forward etc for those to follow. It was bout 7:30 am so there was not, if any; excitement to cause them to panic. They could have gone around the pile or choose not to go through, but when the leader went into that pile and the others followed. I was one of the many interesting moments of that adventure. However, I would agree, one must keep a horse attention on the lesson, if one is to gain the most from that lesson. In building on your description, and while we’re not neuroscience experts, we have observed as you did that horses are natural problem solvers if the conditions are conducive (as Maddy has offered to explain.) Especially if we end up working with a “problem” horse, one that has been abused, turned sour with obsessively rote training regimens, been hammered, etc., the quickest turnaround once we are no longer considered a threat is to get them out onto the horse puzzles. I’ll let the experts explain why, and just suggest that folks pay attention to Maddie, Martin and Dr. Peters and consider the value in the observations such as the one you posted. All of this stuff is fascinating. Dr. Peters and Mr. Black, would you say that a prime opportunity for a horse to experience LTP could also be when the horses head is lowered, ears forward in a relaxed manner mentally connected to the human? Asking a question in essence. Also, what is the difference between dopamine and endorphins? 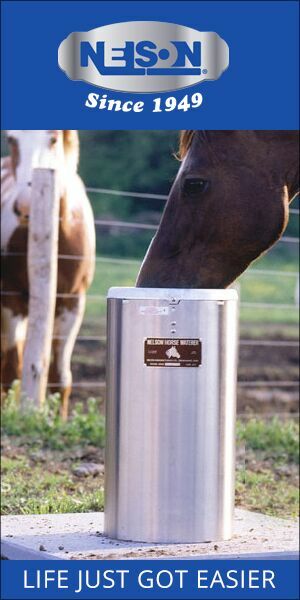 Which is preferable for the horse or human to access? Not really sure if I have even asked the question correctly. Hello from HorseHead, Steve! Endorphins are opioid peptides with actions similar to those of morphine. It is what we call an endogenous (produced within the horse) pain killer. Like with long distance runners it requires some pain in order to be released (the runner’s high). In the popular press it is made out to be a pleasure chemical which is not exactly accurate. In fact, if we have a pleasure chemical, that would be dopamine. Dopamine is the neurotransmitter associated with movement (lack of dopamine can result in Parkinson’s disease in humans) and reward. Dopamine, which runs through pleasure centers in the brain such as the nucleus accumbens, is what is highly rewarding. That is why dopamine is such a powerful component to learning, because it reinforces what we learn. Long Term Potentiation is in essence a more permanent, stronger, longer lasting synaptic connection (a superhighway for information vs a dirt path). The horse is best able to assimilate the information when we allow for a number of things. Firstly we have to have their attention (see RAS article here http://horsehead.info/attention-key-to-your-horses-learning/ ). Secondly it is helpful if they are not overly stressed (just as would be the case with a human). We also need to leave them alone so that they can assimilate and consolidate the information meaning they need dwell time to replay signals over the new pathways. If your horse has its head up above the withers and is ignoring you, they are not going to be in a place to process what you are presenting to them. However, if they have their head down and a leg cocked but care more about the grass in front of them they also will not be in the ultimate state to learn. look for them to be giving you their attention, looking at you, ears on you, engaged. 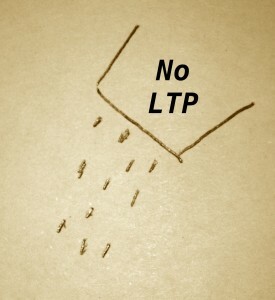 LTP occurs with several good learning sessions. Like with humans, cramming for a test usually results in forgetting everything the next day. thanks again…great explanation of complex material..very useful.